HOLYOKE – Armed with more than 275 flowers and plants, Carey’s Flowers staff set out to put smiles on the faces of Holyoke Solders’ Home residents Wednesday. Little did they know, those residents would return the gesture. The South Hadley flower business participated in “Make Someone Smile Week” by camping out at the Solders’ Home and handing out bouquets and plant arrangements to every resident they saw, while thanking the veterans for their service. Each year, Carey’s picks an organization to surprise during “Make Someone Smile Week” through a national campaign by Teleflora. This was the first year the flower shop chose the Holyoke Soldier’s Home. But it definitely won’t be the last, said Carey. “I had a personal meaning behind it,” he said. Carey’s great uncle was a resident at the Home. Not only did Carey’s staff members set up base in the building’s main entrance, but Soldiers’ Home staff members brought flowers and plants to every single resident in each room of the floors above. “It made me feel good knowing that it definitely did bring a smile to somebody’s face,” said Carey. 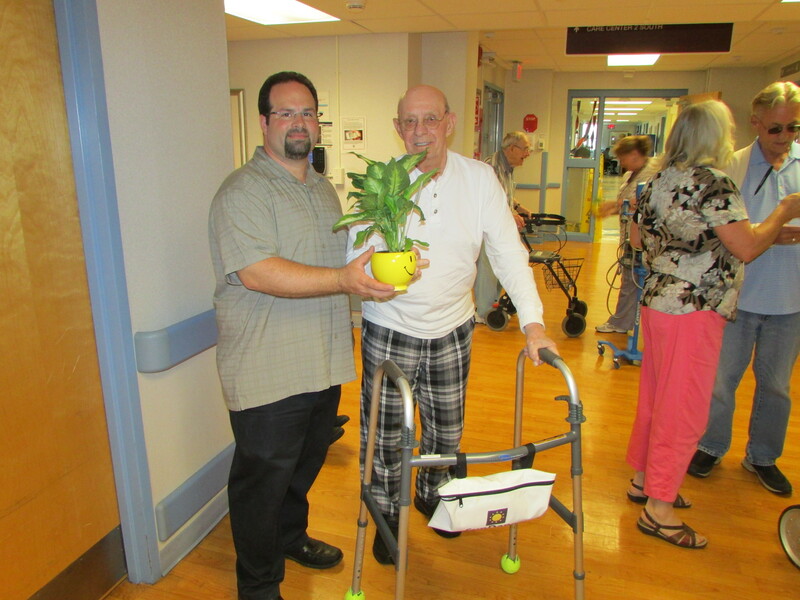 He enjoyed “just handing somebody a plant or a flower in nice container and the way their faces would light up. They were actually waiting in line for their plants,” he said. The simple gesture was dually rewarding. “I don’t know who was smiling more – the people receiving them or the people giving them,” said Carey. John Paradis, communications director at the Holyoke Soldiers’ Home, said the delivery meant more to residents than met the eye. The gift of time spent with Soldiers’ Home veterans, even with the simple act of handing out flowers, is priceless. Paradis called Carey’s act “a wonderful sentiment” and a “very nice act of kindness.” To think of the Soldiers’ Home veterans “was special,” he said.